This page is about using the boat lift. 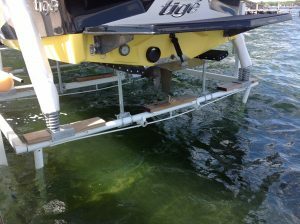 For an inboard boat (which is what the tigé is) the Boat Lift works differently. With the ARK, which had a lower unit in the back, there was a rear stop. You would drive in until the lower unit hit the rear stop then lift the lift (pretty foolproof). For the tigé, there is a front stop. The front of the boat is on an angle, so it is fairly easy to get too far forward in the lift. We need to find reference point on the boat and lift so that we pull it in to pretty much the same point each time before raising the lift. This is *not* the way the boat should be positioned. It is too far forward. We don’t know who was driving the boat to hit the wood, and it doesn’t matter. In the short-term (until Danboms comes to adjust the lift) we have been backing the boat off the lift using the ropes and turning on the engine after it is out of the lift.